Kompozit’allUK Ltd guarantees all FuranFLEX25 and VentilFLEX25 product against any material manufacturing fault for a period of 25 years from the date of installation. This means that the value of ‘cover’ and compensation will remain at 100% for the FULL 25 years (not reduce with age like others in the industry). 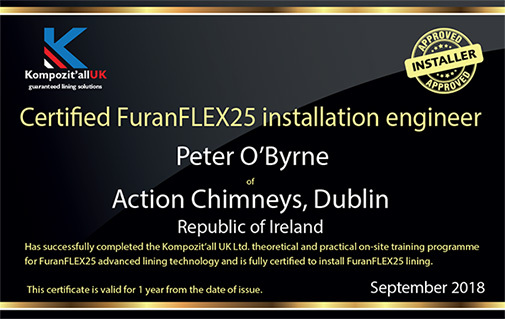 For this guarantee to apply, the FuranFLEX25 or VentilFLEX25 product must have been installed by a registered Company with Kompozit’allUK, where all the personnel have current certification and that the Kompozit’allUK method, as detailed in the technical manual, has been fully adhered to throughout the process. We will be responsible for reinstallation in the case of a manufacturing fault in the liner. This guarantee is believed to be unique, as it does not reduce in cover with age and is only possible due to the quality of our manufacturing control, strict procedures, regular training updates and technical support. What Is an Insurance Backed Guarantee (IBG) & Why Do We Need It? Evolution Insurance, the underwriter, provides a Policy of Insurance to meet claims under the Kompozit’allUK guarantee for the first 20 years, in the unlikely event that Kompozit’allUK Ltd has ceased to trade. ‘This is a unique level of cover on a UK installed product and is based upon the controls that Kompozit’allUK demonstrate’. This is a unique 20 year independent Insurance Backed Guarantee . The Insurer agrees to indemnify the Insured in respect of the cost of making good defective workmanship and/or faulty materials in the original Installation at the location described in the Certificate of Insurance ,arising during the Period of Insurance, where the Contractor has Ceased Trading and is unable to honour the terms of their own Contractor’s Written Guarantee issued to the Insured. What It Means for the Installer? You are able to promise a customer that they will have a fully functioning chimney/ventilation lining for the next 25 years, provided it is maintained properly, with the first 20 years being insured in the unlikely event of Kompozit’allUK ceasing to trade. It differentiates you from your competitors and imitators. What It Means For The Client? They know that they will be ‘looked after’. They feel confident that our organisation is with them through the life of the product. It protects the client’s investment – makes it worth the cost. What It Means For Kompozit’allUK Ltd? It confirms our confidence, commitment and reputation. It differentiates ourselves from our competitors. It demonstrates that we believe in our product, our people and our processes so that clients can believe in us. 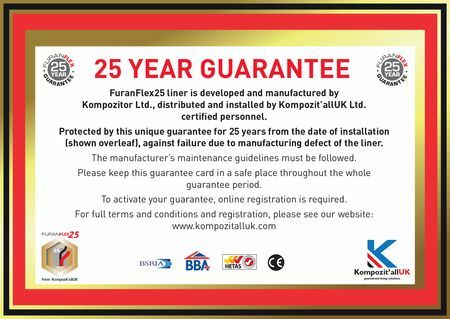 This is an image of the proof of guarantee you will receive when any FuranFlex25 or VentilFlex25 job is signed of by our Kompozit’allUK trained personnel. All our installers will have this certificate which shows they have been trained by Kompozit’allUK and means you can trust in their competence with our products, and they are able to offer the unique guarantee on all projects with our products.